Core competencies’ is deep proficiency in the organization that enables it to deliver unique values to the customers. It embodies organization’s collective learning especially coordination of the diverse production skills and the integration of the multiple technologies. ‘Core competencies’ is hard for competitors to copy or to procure. Core competencies’ creates sustainable competitive advantage for the organization and helps it to branch into a wide variety of related markets. It contributes substantially to the benefits of the organization’s products offer to the customers and hence effectively helps in the businesses of the organization. Understanding of core competencies allows the organization to invest in the strengths that differentiate it from others and set strategies that unify the entire organization. Core competencies’ is a concept in the management theory which was introduced by CK Prahalad and Gary Hamel in 1990 through their article ‘The Core Competence of the Corporation’. Success of an organization depends on acquisition of core competencies and development of core products. The concept as explained in the article is summarized here. This concept of core competencies provides advantage to the organization. It is found in the ability of the management to consolidate organization wide technologies and production skills into competencies that empower the individual businesses of the organization to adapt quickly to the changing opportunities. The ability of the management to identify, cultivate, and exploit the core competencies makes the growth of the organization possible. Decentralization in the organization makes it difficult to focus on core competencies and in such case there is increasing dependence on outsiders for critical skills. Core competencies’ is not necessarily about outspending rivals on research and development, sharing costs among business units and integrating vertically. These actions themselves are not sufficient in building of core competencies but they may facilitate it. Core competencies’ leads to the development of core products which are used further to build several products for end users (end products). Core competencies are developed through the process of continuous improvements over a period of time rather than through a single large change. To succeed in an emerging global market, it is very important for an organization to build core competencies rather than vertical integration. There are three tests which can be applied to identify core competencies in an organization. These tests are as given below. A core competence is difficult for the competitors to imitate. It is difficult since it is a complex harmonization of individual technologies and production skills. A competitor might acquire some of the technologies that comprise the core competence, but he will find it very difficult to duplicate the more or less comprehensive pattern of internal coordination and learning. ‘Core competencies’ is the collective learning in the organization, especially how to coordinate diverse production skills and integrate multiple streams of technologies. It is about the organization of work in the organization as well as the delivery of values. It is also communication, involvement, and a deep commitment to working across organizational boundaries. Core competencies’ provides the organization with differential advantage which helps in improving its long run competitiveness. This is because it improves the ability of the organization to build, at lower cost and more speedily than competitors, the expertise and production skills that spawn unanticipated products. It helps the organization to consolidate organization wide technologies and adapt quickly to change in opportunities. Core competencies’ involves many levels of employees in the organization and all of the organizational functions. It helps skills and core competence to coalesce around individuals whose efforts are not so narrowly focused that they cannot recognize the opportunities for blending their functional expertise with those of others in new and interesting ways. Core competencies’ does not diminish with use like physical assets which deteriorate over time. Competencies like knowledge are enhanced as they are applied and fade away if they are not used. Hence they are to be nurtured and protected. Competencies are like glue that binds existing businesses. They are also the engine for new business developments. ‘Core competencies’ guides the organization towards diversification and entry to new markets. Only a few organizations are likely to build global leadership in more than 5 or 6 fundamental competencies. Three different planes on which organizations wage battle for global leadership are core competencies, core products and end products. It is essential to make distinction between these since global competition is played out by different rules and different stakes at each level. To build and defend leadership over the long term, the organization is to be winner at each level. The organization must maximize its share in the core products in order to sustain leadership in the chosen core competencies area. Control over core products is also critical since a dominant position in the core products allows the organization in evolution of the applications of end products in the markets. There is tangible link between identified core competencies and end products. This link is core products which are the physical embodiments of one or more core competencies. Core products are the components or subassemblies that actually contribute to the value of the end products. The organization is like a tree which grows from its roots. Core products are nourished by core competencies and engender business units, whose fruit are end products. This tree as given by CK Prahalad and Gary Hamel in their article is shown in Fig1. With investment, an organization may beat its rivals in technologies, yet still lose the race to build core competencies leadership. When the organization is gaining the race to build core competencies (as opposed to building leadership in a few technologies), it outpaces its rivals in new business development. If the organization is winning the race to capture world manufacturing share in core products, it will beat rivals in improving product features and the price/performance ratio. Often organizations have the technical resources to build competencies, but their management lacks the vision to build them and the administrative means for assembling resources spread across multiple units. A shift in commitment inevitably influences patterns of diversification, skill deployment, resource allocation priorities, and approaches to alliances and outsourcing. Organizations which judge competitiveness, their own and their competitors’, primary in terms of the price/performance of end products are courting the erosion of core competencies or they are making too little effort to enhance them. The embedded skills that give rise to the next generation of competitive products cannot be ‘rented in’ by outsourcing and OEM supply relationships. In this way the organization unwittingly surrenders core competencies when it cuts internal investment in what it might had mistakenly thought were just ‘cost centres’ in favour of outside suppliers. There are two clear lessons as regards to core competencies. The first is the cost of losing a core competence can only be partly calculated in advance. As regards second, since the core competencies are built through a process of continuous improvement and enhancement that may span a decade or longer, a company that has failed to invest in core competence building will find it very difficult to enter an emerging market, unless, of course, it will be content simply to serve as a part of distribution channel. For the development of core competencies, the following issues are important to understand. 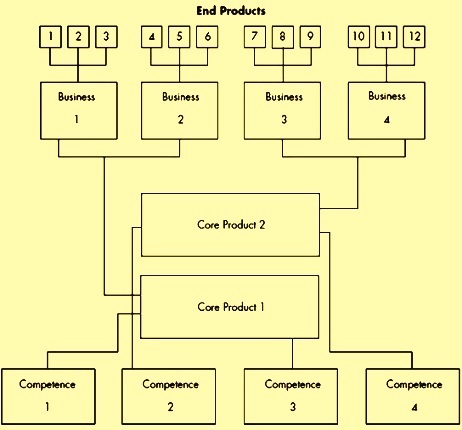 Under investment in developing core competencies and core products – This usually happens in case of multi unit organization where no single unit may feel responsible for maintaining a viable position in core products nor it be able to justify the investment required to build world leadership in some core competencies. Imprisoned resources – Typically the people, who embody the competence, are attached to the unit to which they grew up. The management of the unit not only unwilling to lend their competence carrier to the organization, but it may actually hide talent to prevent its redeployment in the pursuits of new opportunities. When competencies become imprisoned, the people who carry the competencies do not get assigned to the most exciting opportunities, and their skills begin to decline and the organization as a whole loses. Bounded innovations – If core competencies are not recognized then the organization loses innovation opportunities with respect to the marginal product line. For building core competencies at the organization level, it is necessary that organizational top management spend a significant amount of time in developing an organization wide architecture that establishes objectives for competence building. A strategic architecture is a road map of the future that identifies which core competencies to build and their constituent technologies. It is important to identify core competencies because it is difficult to retain those competencies in a price war and cost cutting environment. It is also necessary to integrate core competences using strategic architecture in view of changing market requirements and evolving technologies. Management must realize that stakeholders to core competencies are an asset which can be utilized to integrate and build the competencies. Competence building is an outcome of strategic architecture which must be enforced by top management in order to exploit its full capacity.